Aside from chasing autonomous cars, I covered a little other Silicon Valley local tourism. Plaza de Cesar Chavez in downtown San Jose was nice and tidy. And with those colorful chairs out I thought it a good opportunity to shoot some stock. And I wandered over to the San Jose Museum of Art too. And took a look at what changes have come to the Googleplex. Guess the latest android operating system is “Oreo”. I almost forgot- I also visited Shoreline Park in Mountain View. There’s also the Rengsdorf House from back in the day when Mountain View was rural. Setting my sites on home, I thought it might be a good time to revisit Youtube HQ in San Bruno. There was a lot of security out front. There had been a shooting at the site a few weeks earlier. One of the security guards was a total d!ck telling me I couldn’t photograph from the sidewalk, then giving me sh!t when I told him I could. Another lady followed me and aggressively asked why I was photographing the building. Argh! I went to my photos.google.com page and the assistant made some super-cute animated GIFs from the photos I took of a couple of different self-driving cars. Just to clear things up first, no you will not see any photos on this post of the new rumored Chrysler-Fiat Pacifica Self Driving minivan. It is in the works as I understand it, and have seen some photos online in a Google parking garage. But eventually, they will have to take this thing out for testing, and I’ll be there ASAP snapping away. However, I did get to sit on a bench on a pleasant fall day and snap some nice photos of other Google autonomous cars passing by. I felt kinda like a fisherman might feel fishing out of a stocked pond. At one point (while I was on the phone to my friend and fellow photographer Christian 1*) I heard the electric car whirring sound on my left. I excused myself from the phone call, stood up and saw two of those cute 2 seat prototype autonomous cars on my left, then looked to the right and saw another one! It was like I was being surrounded. Unfortunately for my stock photo luck, there was another interesting scene – that could have been an even better contrast had there been a self driving car there as well. A homeless guy (?) came riding down the slight hill next to the Google X building carrying a bunch of huge bags full of recycling. I’ll head down soon and see if I can find this rumored vehicle in the wild. A while ago I wrote a little piece about the new “Android Graveyard.” Google had a sculpture garden in front of a more prominent building on the Googleplex. They moved all their sculptures (I caught them in pieces getting touch up job in the last post.) Now they are in an out-of-the way corner in a peripheral building near the Google-central. What Google started doing was unveiling a new sculpture with each OS release. Android operating system releases are named after sweets. Now with the birth of a new OS, there’s a death and a sculpture is added to the Android Graveyard. This time came was the the birth of Nougat, and the death of Marshmallow. 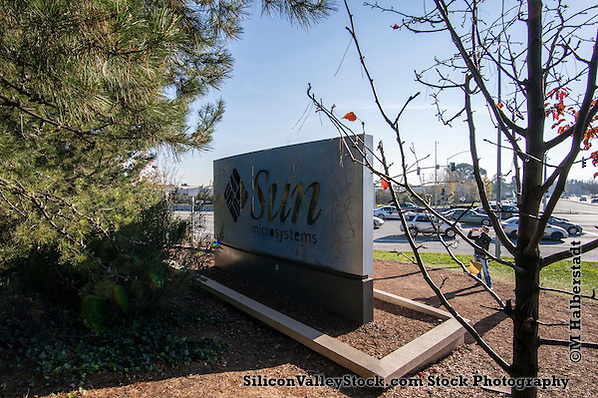 Here are a few stock photos of a Silicon Valley graveyard. Recently I stumbled upon a story by the British publication The Guardian warning that sea level rises threaten Google, Facebook and other tech titans‘ fancy buildings. I’m not a big climate skeptic, but this article really appeared to have some major factual errors and was designed to alarm and incite. (Over)dramatization of Sea Level Rise in Silicon Valley (Michael Halberstadt)- Hey that marshmallow turned out to double as a floatation device! 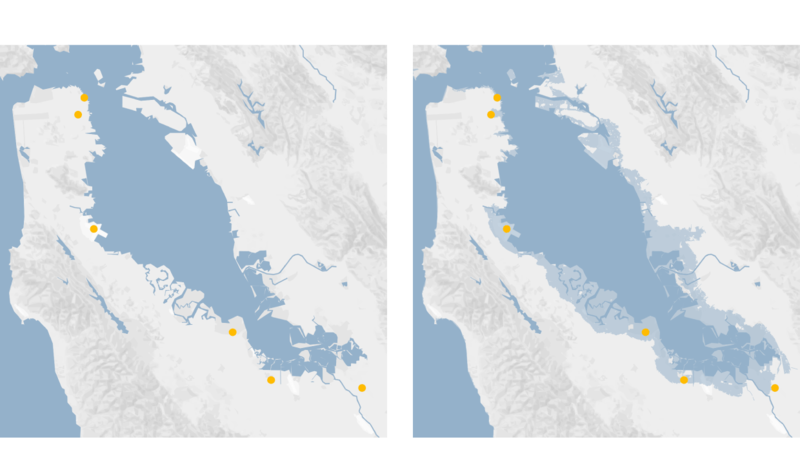 First off, they start with a map of the San Francisco Bay with selected tech companies dotted along the coast- then a second map with where the coast would be with a 6’ sea level rise. What’s wrong with that picture? First off, they don’t point out that 6’ is the most pessimistic estimate for the year 2100! I’m reminded of the steamroller scene in Austin Powers. Scientific American published a similar story in 2012 with some easily verifiable errors and some golden quotes like: “’They don’t think long-term’” (duh, the lifespan of SV companies is about as long on average as mice,) and this rather curious quote: “….Silicon Valley is 3 to 10 feet below sea level…..” There may be an exception here and there, but the VAST MAJORITY of Silicon Valley is not below present sea level, or even very close. You can poke around the map of SV with this tool for the actual height above sea level as could Scientific American if they cared to fact check anything. Let’s put this in perspective…. Why don’t we look back about a century and ask about the status of the biggest companies of the day? In researching this, I found that the Fortune 500 list is only available starting in the year 1955. As you might have guessed- many of the companies on that list only 61 years ago are gone or forgotten. Number one on the list was GM, that narrowly avoided collapse by government intervention a decade or so ago. I don’t even think it’s worth the time to research, but I’m assuming that many of those companies HQ’s have been bulldozed, burnt down, or more likely sold and reused for another purpose. Another way of looking at this: If I told you that MySpace HQ was near a fault line and would likely collapse in an 8.0 or greater earthquake you would likely either 1) ask “what’s Myspace?” or b) say why should I care, they can retrofit, or move or go out of business for all I care. Of the historical tech companies of Silicon Valley we have some remnants. But not much is left- including interest by the young and wealthy hipster class that writes that dribble. 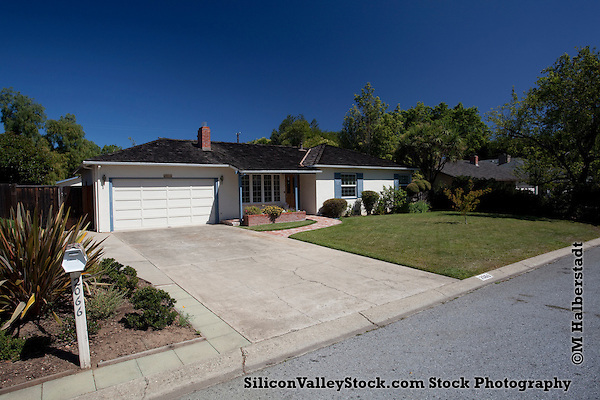 You can visit the house in Los Altos where the first Apple computers were built. You can see the garage where HP got their start. But if you do, you will usually only see a couple of die-hard tech fans. And most of the sites where Silicon Valley history was made are lucky to have a brass plaque. Visitors to Silicon Valley are likely to breeze past. It’s easy to get caught up in the here and now. Yet we can look at things in perspective. Empires rise and fall- so does sea level. Though we should take adequate measures to avoid problems, the fate of a bunch of the playgrounds of the ueber rich in a century shouldn’t be on our list of priorities. On a recent trip to Google’s sprawling campus in Mountain View I had an odd encounter. Unfortunately I wasn’t well situated to document what I saw. As I was trying to get my own aerial view a crew of three showed up right next to me and plopped a drone on the ground. For safety reasons I retracted my rig and moved over. One fellow donning a hard hat had a tether that was attached to said drone. The got it started and walked into the Quad area. I’m assuming they are Google X people, I can’t imagine that security would have let a setup like that in the belly of the beast if they weren’t at least Googlers. And in my handful of photos, I could zoom in and see a badge tucked into one of the fellows pockets. Are they competing with Amazon? Just doing this for pure research? Fun? I don’t know. All I do know is they got at least twice as high up as I did! It’s kind of like being a Paparazzi- only I’m stalking Google X-projects. Once again I trawled the usual spots looking for that adorable little Google Self Driving Electric Car with the irritated at my presence Googlers inside. Sorry guys, your project is interesting to me and billions of others. Besides, you are testing in a public parking lot! The car just parked in the same place for a long time. I went out to photograph other stuff in the neighborhood and it still hadn’t moved. Eventually I figured I’d just drive up and get a few closer up shots. <begin rant>One thing that really gets me….. Google, the folks who sent two security guards to intercept me before I could reach the “Visitor Entrance” to ask if they had tours, the company that sends cars with giant cameras recording huge swathes of things public and private from the roadway….the company that knows more about you and me than the NSA….the company that has more money than god…. Well, they whine and complain when I take photos of them and their very newsworthy Google X project. Mind you I’m not stalking them to be irritating, they are involved in very newsworthy activities, like changing the way the world drives. At the same time they (Google and other extremely wealthy tech companies ) appropriate public spaces for private uses. By now most people have heard of Google and other tech companies using public bus stops in San Francisco and Oakland for their private buses without permits. The defacto control a huge public parking lot weekdays in Mountain View too. 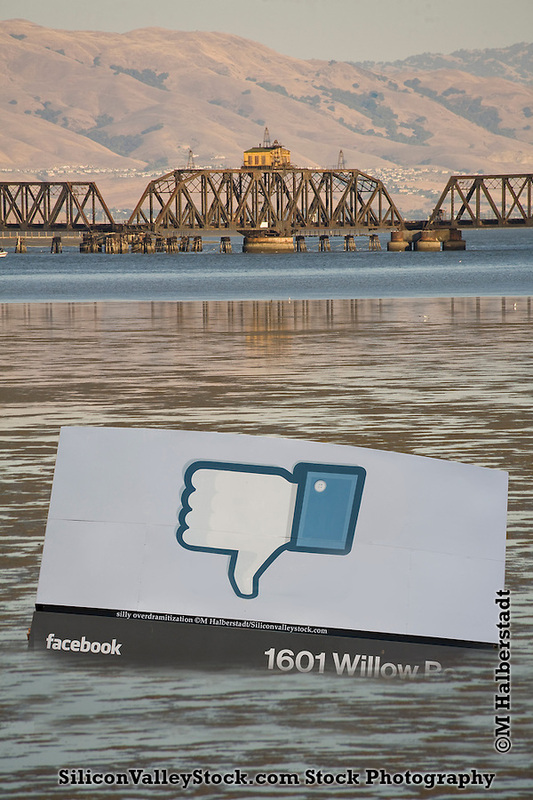 Eventually I moved on to track down some items on my stock photo map of Silicon Valley. I figured somebody is going to have to write about @Walmartlabs at some point, and I had an address for them also in Mountain View. So I headed over to the address I had listed, 444 Castro Street only to find that it’s a huge office building with no signage. Later research showed that Walmart Labs appears to once have been located there, but has moved on. There are plenty of other important and perhaps soon to be important companies at that address, so I reckon this wasn’t a complete waste of time. Why I keep headed back to Stanford is another question. Don’t I have enough coverage? Apparently not. Technically, Stanford is actually its own place, not part of Palo Alto as I lump them together in my stock photo library. I tried to get a few shots of the more modern, lesser touristy but more valuable in the stock photo sense, like a few of the laboratory facades, some boring stuff etc before I headed back to the Quad. It was a good opportunity to try out a new set of equipment I have. My Canon was acting weird which forced me to rush and buy a camera I’ve wanted for some time. The Sony A7r has a few advantages over the Canon that came in handy on this shoot. The obvious are the much larger images – which open up at about 100 mb in Photoshop vs my Canon’s 60 mb. The less obvious is that the EVF is capable of displaying the camera’s level status both left & right as well as up & down. If you want architecturally correct photos, which I usually do, with a shift lens- that’s hard to do without a tripod. No more…. and avoid the tripod gestapo that routinely chase me around. Now on to the pretty stuff. This reminds me that I should drag “Baby Genius” (my daughter) and her friends out here for a field trip sometime. She seemed to enjoy our trip to the Berkeley campus. One major reason I think Stanford seems so pleasant isn’t just its retro architecture. The fact that there are basically no cars removes alot of the noise and hubbub that makes people anxious. It makes me wonder what cities were/would be like without car traffic. After the sun went down, but before it was really dark, I strolled past the memorial church. The glow from within matched the light outside and I could faintly hear music practice from inside the “Round Room”. Truth be told, I’m an atheist…but the Memorial Church is one of the more beautiful buildings in the Bay Area as far as I’m concerned. Feeling pius in a Prius…. Google’s Prius version of its self driving car lineup is shown above. This is part of my stock photo collection of Silicon Valley that also includes the Lexus and their made from scratch two seater (sans steering wheel).